What do you when you have a few wood trunks, a couple of diggers and a top Austrian permaculture innovator at hand? You build a hugelkultur bed and pond system... obviously! Organised by Chiwara Permaculture Research & Education and in association with the Michigan Folk School – who specialise in the promotion of learning and teaching of traditional folk arts – this is one of many courses designed to help the restoration of damaged forests and farmland ravaged by widespread unsustainable management. Hosting courses as diverse as blacksmithing, natural beekeeping, cheese-making 101 and permaculture courses, it is not too surprising to see Sepp Holzer's involved in one of their projects: the creation of a pond and surrounding hugelkultur beds. For those of you new to the intriguing hugelkultur word, you might not be surprised to hear that in true permaculture style, these systems are at once relatively very simple to build and maintain, yet extremely efficient in producing a high output of food. A hugelkultur bed is a method mastered by Sepp Holzer, where wood is layed down, mounted and covered with dirt and other organic matter. Methods vary; you can simply place the wood on the ground and build from there or alternatively, you may also build a trench first. As the wood rots within the bed, its capacity to hold water increases, while also naturally creating types of beneficial fungi and a hospitable home to various worms and other micro-organisms. This way, you very quickly, but continually enrich the soil, with the need for watering decreasing too. In this way, it is almost a self-feeding, self-watering system requiring little maintenance and especially suited to the sustenance of plants from less arid zones. To make the most of these beds however, Sepp Holzer suggests "selecting plants that demand a very high nutrient content: pumpkins, courgettes, cucumbers, cabbages, tomatoes, sweetcorn, celery and potatoes to name a few. In beds like these it is better to cultivate less demanding plants like beans, peas and strawberries after three years. If they are planted any earlier they might become overfertilised, and not develop a good flavour." Course students were given basic instructions by Sepp, but were collectively involved in the design aspects of the installation. The design was spontaneous and work began almost immediately. Despite hitting concrete foundations on the first days, drawing work to a halt, the team persisted on day 2, laying down the wood and biomass to be built upon. With these basics in place and the diggers now busy on pond excavation, the team began shaping and planting the hugelbeds. Though hugelbeds can vary dramatically in size, these were designed to be large, reaching around 5ft. This increases the growing surface but also makes fruit and vegetable harvesting easier, also improving accessibility to younger children and those with back problems. Two more layers remained for the team. Firstly, a layer of wooden lattice was placed over the beds in order to protect their steeply rising shape, eventually degrading its way into the surface of the beds. On top of this is the placed a final bed of straw mulch, simultaneously feeding the soil, protecting the seeds from birds and retaining moisture and suppressing weeds until growth begins. Finally the pond was properly graded, seeing the completion of this big project. The natural pond will fill up naturally, seeping water into the surrounding landscape including the hugelbeds. This really means that the beds will require very little watering, if any at all and provides the perfect environment for growing slightly different types of plants that might otherwise not do so well in a simple raised bed. Because the high nutrient content of these beds can remain for up to 15-20 years, this project is a truly good investment of time and money for the little input that will be required over the coming years. 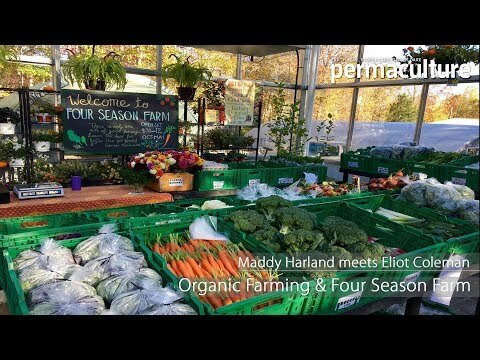 Permaculture Farm and Education Center!!! I'm creating (with loads of agreement) a permaculture farm and educations center, in Sears, MI. I'll post relevant updates, as the occur. I'm looking forward to 'exchanging' everything I can, with 'The Michigan Folk School'!!! It's 2017. Would you post follow up photos and let us know how the project worked out: what it's weaknesses and strengths were, as well as what you'd do differently and how? How local economies create local jobs, revenue, community relationships and business.